Boy Scout Troop 125 of Commack held an Eagle Court of Honor at the Commack United Methodist Church to honor Scout Joshua Isaac. 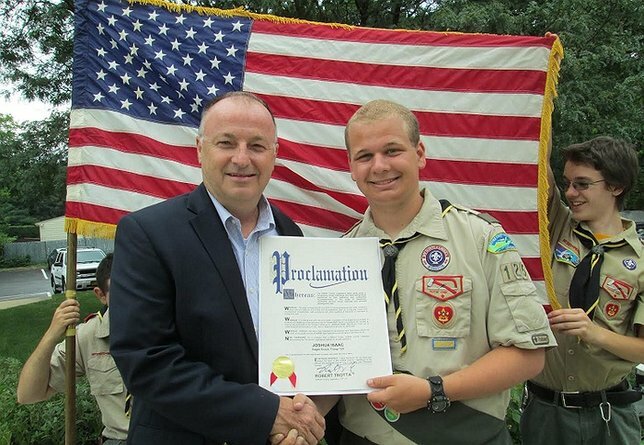 Suffolk County Legislator Rob Trotta presented Scout Joshua Isaac with a proclamation for achieving the rank of Eagle Scout. Commack, NY - July 25, 2016 - Boy Scout Troop 125 of Commack held an Eagle Court of Honor at the Commack United Methodist Church to honor Scout Joshua Isaac who earned the esteemed rank of Eagle Scout by completing a labor intensive community–based Eagle Scout project. Joshua’s project was to provide signage and parking improvements at Temple Beth David in Commack, NY. Joshua built and installed a new welcome sign at the Temple. In addition, he cleared debris from the parking lot which provided eight extra spaces, as well as repainting the curbs and speed bumps and adding one way arrows in the parking lot. “It is always an honor for me to be invited and attend an Eagle Court of Honor as Eagle Scouts attain this achievement while still a teenager and it is a recognition and an award that can never be taken away and will be highly regarded when one applies to college and for employment,” said Legislator Rob Trotta. “Joshua has demonstrated that he is an active member of the community and plans to stay involved with the scouts, which indicates to me that he wants the best for the youth of our great County of Suffolk,” added Legislator Trotta. Legislator Trotta serves on the Legislature’s Economic Development, Environment, Planning &amp; Agriculture, Health, Public Works, Transportation &amp; Energy, and Ways & Means Committees. Subject: LongIsland.com - Your Name sent you Article details of "Joshua Isaac Soars to Eagle Scout and is Recognized by Suffolk County Leg. Rob Trotta"